The SharkCopier DCLS can connect over 65,000 manual tower duplicators to run off of a single source for duplication and laser labeling. Los Angeles, CA (Vocus/PRWEB ) July 6, 2010 -- Vinpower Digital announced today the release of the SharkCopier DCLS standalone manual tower CD / DVD / Blu-ray (optional) daisy chain systems with standalone LightScribe capabilities. These units offer all the options and benefits expected from the SharkCopier LS line of duplicators with the added capability to be linked together in a chain, copying or printing across each tower using only one source. This is extremely beneficial to those who need to create numerous copies quickly in a short period of time with only 1 or a few master sources to copy from. 1) Ensure that each tower is properly connected and powered on. 2) Fill all of the writer drives with blank media consistent with the master source. a. Leave the top writer drive on the first tower empty for the master disc. b. For LightScribe labeling, place the LS capable disc label side down in the drive tray. 3) Place the master disc into the top drive on the first tower in the chain. a. After the first run, the master disc can be removed and this drive can be used as another writer drive. 4) Initiate the Copy or Print operation and every drive filled with appropriate media will duplicate or print across each tower simultaneously. “With the ability to copy and print from a single source across all drives in every chained tower, the SharkCopier DCLS can be in affect the largest publishing system available today”, said Calvin Chang, C.E.O Vinpower Digital. In addition to the Daisy Chain capability, each unit can also operate as a single standalone system when the duplication or printing capacity does not require as much output. This allows the user greater flexibility and more control over the copy and printing process and the speed of output. 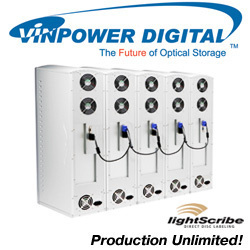 Vinpower Digital is the leading manufacturer of standalone optical disc duplication equipment. With our corporate office in Los Angeles, California, USA and production offices in Taipei, Taiwan, we have the ability to deliver the most advanced and reliable standalone optical disc duplication controllers, manual towers, and robotic autoloaders anywhere in the world. As a true manufacture, Vinpower Digital has the ability to OEM/ODM customized applications and equipment for qualified vendors on a number of levels. Never satisfied with good enough, Vinpower Digital constantly pushes the envelope to develop new features and enhance their existing product to stay in tune with the customers’ needs and expectations. For further information on any or all of Vinpower Digital’s line of duplicators please visit our website at www.vinpowerdigital.com.